Want something warm & comforting? Try our Grilled Tuna Melt sandwich with melted cheese on whole grain bread. 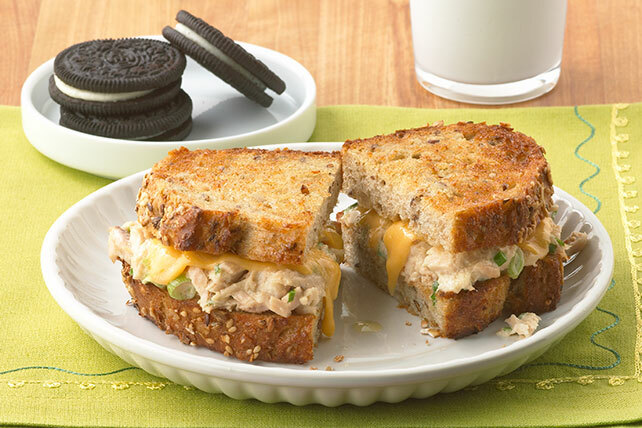 A Grilled Tuna Melt is great any time of day. Combine tuna, mayo and onions. Fill bread slices with tuna mixture and Singles. Cook in skillet sprayed with cooking spray 3 min. on each side or until golden brown on both sides. Save 50 calories and 7g of fat per serving by preparing with MIRACLE WHIP Dressing. Substitute celery or red onions for the green onions. Prepare using KRAFT Light Mayo Reduced Fat Mayonnaise and KRAFT 2% Milk Singles.